Starting with carefully analyzing customer requirements, we then determine the right questions to ask. 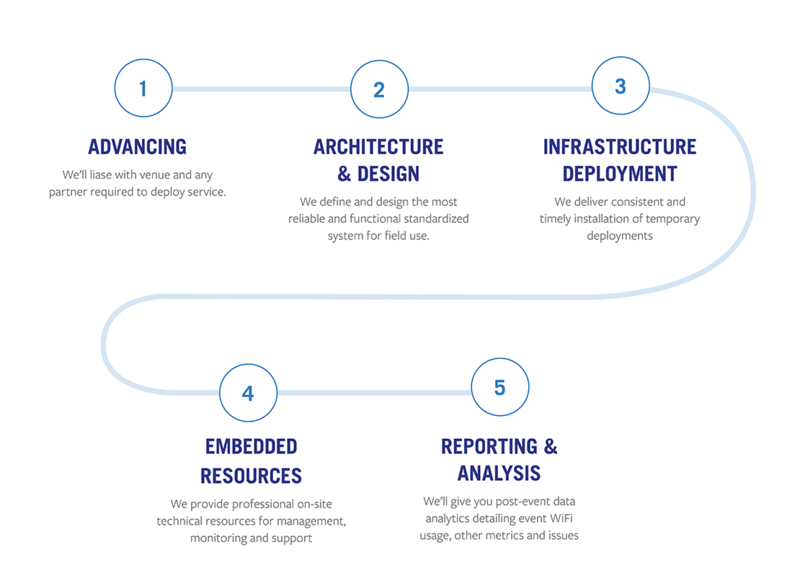 Next, we move on to building a live event IT infrastructure that’s highly flexible and scalable without requiring any significant or unnecessary increases in cost. We look forward to working with you to provide the same degree of live event tech success that all of our customers have experienced with us. THE EARLIER YOU START YOUR LIVE EVENT WiFi PLANNING, THE BETTER! If you’re planning on producing a live event, we’re ready to help. We follow a proven step-by-step approach to live event WiFi that simply works. World-class events need world-class experts. Our decades of experience in live event internet and WiFi give you confidence that the show WILL go on. Contact us for a quote today.